Chicago Cubs President Theo Epstein spoke to the media on Thursday afternoon at Wrigley Field, and he covered a list of topics ranging from free agent priorities to the play of Miguel Montero to the development plans for Kris Bryant, Kyle Schwarber, and Javier Baez. To help recap the day at the Friendly Confines, here is a list of the five biggest takeaways from the press conference. Granted, none of that insinuates that the Cubs will go after one of the top-of-the-line free agents like David Price or Zack Greinke, but it would seem to indicate that they would be open to doing so. Both players will command large salaries, but with the savings the Cubs are getting as a result of having a lineup loaded with young, cost-controlled players, there is definitely incentive for them to add a top-of-the-line starter to take some pressure off of Jake Arrieta and Jon Lester. “We’re keeping all the options open, as long as we’re not getting in the way of his development,” Epstein said of Kyle Schwarber and whether he would continue to work on his game behind the plate. He also said that the team likes the “imperfect path” in terms of allowing Schwarber to develop while playing at the big league level, preferring to keep his bat in the lineup instead of sending him down to the minors for more seasoning. There has been plenty of talk about Schwarber’s future as a fielder with the Cubs after his route-running came into question during the NLCS, but Epstein and the front office clearly believe that he can develop into a serviceable player at either position, and that keeping his bat in the lineup is a priority to forcing him to take extra reps at either position during a minor league stint. Arrieta is not set to become a free agent until after the 2017 season, but with his dominant performance during the 2015 campaign, there are increasing calls for the Cubs to lock him up to a more team-friendly deal before a free agency campaign would likely raise his asking price. It doesn’t sound like Epstein is looking to lock up Arrieta any time soon, but conversations will surely take place with Boras this offseason as the Cubs pursue other free agents. 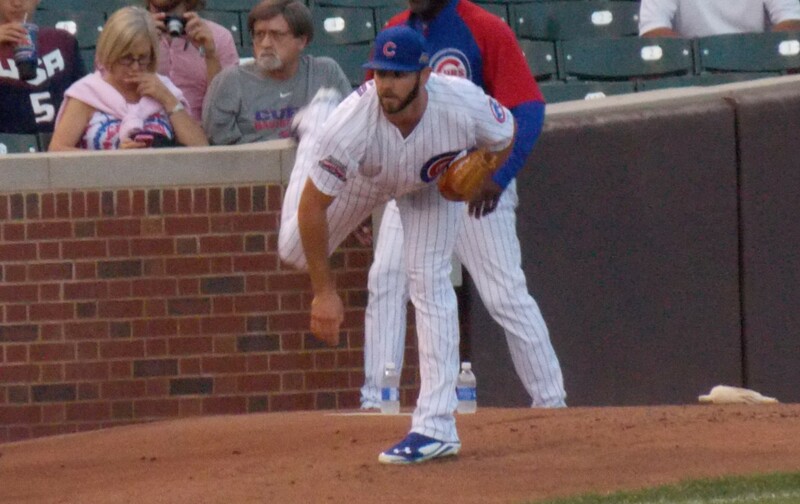 “He is that guy that you saw in the first half when he’s 100 percent and locked in, and it’s our job to get him that way for the first week of the season next year,” Epstein said when asked about Hammel’s status for next season. There have been plenty of questions about whether the Cubs will add a top-line starter and a young, cost-controlled guy to the rotation, and about what that would mean to Jason Hammel’s status, but it seems that the Cubs are planning on having him in the mix for a starter’s job next season. Hammel will be entering the second year of a two-year contract that he signed with the Cubs, and he’ll be looking to rebound after an awful second half that saw his confidence dwindle and his performance suffer. With the huge amount of positional prospects the Cubs have, it isn’t shocking that Epstein said the team is going to look at potentially giving both Javier Baez and Kris Bryant time in the outfield. 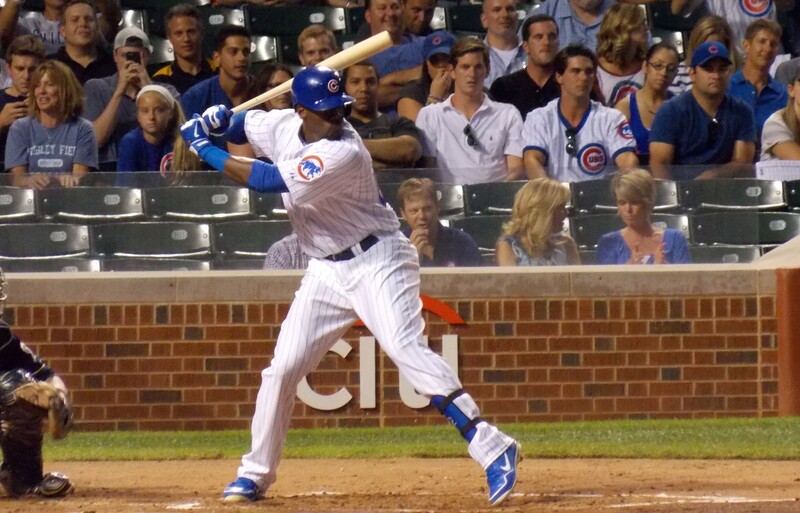 Bryant played some at all three outfield positions this season, and with his arm and deceptive speed, he could potentially be a fit in right field for the Cubs if they choose to go in that direction. The real question becomes, of course, whether the Cubs want to keep just one true outfielder and have Schwarber and Bryant serving as the corner guys. That is a big if from a defensive perspective, as we saw what happened when they skimped on defense during the postseason. A spring training spent developing talent and route-running could be just what the doctor ordered for both players, but it will be interesting to see how serious the Cubs are about having those types of players in the lineup on an everyday basis in those positions. While the Chicago Cubs deal with decisions over whether or not they should mortgage part of their future for a better chance at success in the present, another debate topic has been percolating around the sport of baseball, as discussions abound as to whether or not MLB should move back the non-waiver trade deadline. That deadline, which currently sits on July 31, was established in 1986, when baseball only had four playoff teams each season. That meant that by the middle of July, teams knew whether or not they were in viable contention for a playoff spot, and that meant that more teams were able to make decisions as to how they should proceed in terms of roster construction. Nowadays, that number has increased to 10 teams, and you now have teams like the Chicago White Sox and Detroit Tigers that still have an outside chance of making the postseason instead of knowing that they should be selling off assets and going in a completely new direction. Manfred’s statements bring up two interesting questions: should MLB change the deadline date, and if so, when should they move it to? The answer to the first question is an emphatic yes. Having a dearth of trading partners makes the trade deadline pretty much meaningless as it stands right now, but moving the date would give teams an opportunity to either hold out longer before making a decision or take advantage of their status as sellers in order to get better deals on starting pitchers, giving teams more bang for their buck in a trade and likely increasing the return in those swaps. As for when the deadline should be set, an August 31 deadline would be feasible, but likely shouldn’t be adopted. If a team were to trade for a starting pitcher, it seems unlikely they would be willing to give up much of anything for a guy who will only get a handful of starts before the postseason begins. Can you imagine the return the Detroit Tigers would get on David Price if they waited until there was only one month remaining in the season to ship him out? Instead, the league should push the deadline back by two weeks, putting it at August 15. There is still plenty of meaningful baseball that could be played at that point, and it doesn’t really impact the return on players as much as a month-long extension would. The Chicago Cubs started out their season with a shutout loss to the St. Louis Cardinals with Jon Lester on the hill, and they finished off the first half of the campaign in identical fashion as they dropped a 6-0 decision on Monday night at rain-soaked Wrigley Field. Aside from the crazy similarities between games 1 and 81, the fact remains that the Cubs are in a pretty good spot. They are nine and a half games behind the Cardinals in the NL Central, but they do hold a two and a half game lead over the New York Mets for the second wild card spot in the National League, they have gotten some tremendous pitching as of late, and young stars like Kris Bryant and Anthony Rizzo have been playing very well for a team that is looking to be a serious contender for the first time in nearly a decade. Even with those positives, there are still plenty of reasons for concern. The team has one of the worst offenses in the National League, ranking near the bottom of the heap in the senior circuit in terms of runs scored (11th), batting average (13th), and strikeouts (most in the NL). They haven’t gotten the type of production they’ve needed from guys like Miguel Montero and Dexter Fowler, and players like Starlin Castro still aren’t quite living up to expectations. Add to that the fact that Jon Lester has had difficulty performing consistently (although measures like Fielding Independent Pitching and others indicate that he is better than he’s been given credit for) and the fact that the Cubs are just 2-8 against the Cardinals this season, and there are some reasons for concern and pessimism after the halfway mark of the season. Despite those negatives, the positives far outpace them. Joe Maddon’s team has developed a never say die attitude, going 19-15 in one-run games so far this season. They may be striking out a lot, but they’re walking a lot too, with the fifth-most free passes of any team in baseball. They are stealing bases at an excellent rate, converting on over 73% of their attempted steals. They have found ways to win even as their offense has sputtered, winning thanks to creative tactics and tremendous pitching over the last month or so of play. Most importantly of all, the Cubs have persevered through injuries and the second-toughest schedule in baseball this season and still are in prime position to secure a playoff spot. Maddon has this group believing in themselves, and with all of his techniques and little tweaks to the lineup and the strategy of the team, he really has effected a serious culture and attitude change within the 25 men on the roster. That, perhaps more than any other factor, represents why Cubs fans should be optimistic after the first half of the season. This team has fully bought into what Maddon has been preaching, and although their offense has struggled and the final order of the bullpen hasn’t been established (although adding Rafael Soriano to the mix will make an already strong bullpen even better), this team has found ways to win, and that’s the key ingredient if a team wants to make an October run. The Chicago Cubs had a pretty bad Monday night overall as they dropped a 10-9 decision against the St. Louis Cardinals, but the news got even worse as it was revealed that outfielder Chris Denorfia will be placed on the 15-day disabled list with a pulled hamstring that he suffered in the game. Denorfia, who has appeared in 12 games for the Cubs this season and is batting .429 with a .931 OPS, will be replaced on the roster by Matt Szczur. He was pulled from the Iowa Cubs’ game on Monday night in the eighth inning, so the corresponding roster move should be made soon. The injury could not come at a worse time for Denorfia, who had a three-game hitting streak halted by the hamstring ailment. He was 2-for-2 with his first RBI of the season on Monday night when he pulled the hamstring going from second to third base, and he was immediately pulled from the game. After showing some prodigious power in Cactus League play, Szczur has slowed down a bit for Iowa this season, hitting .250 with a home run and five RBI so far on the triple-A campaign. On Friday afternoon, the Chicago Cubs were sitting at 13-8 on the season, Addison Russell had just hit his first career home run, and Jon Lester had pitched a gem of a game and gotten his first win in a Cubs’ uniform. Everything, as they say, was coming up Milhouse. Then, in the blink of an eye, everything seemed to unravel. The Cubs’ bullpen began to falter. Their starting pitching vanished. Their offense even vanished over the weekend as they were badly outscored and dropped two straight games to the Milwaukee Brewers. On Monday night, it appeared that they were back on track as they took a 5-0 lead in the first inning, but it all came undone as Travis Wood surrendered four runs and the Cubs ultimately lost the game thanks to some poor work done by their bullpen. A quick perusal of social media after the game revealed plenty of anger within the Cubs’ fan base, and rightfully so. This was a game that the Cubs by all accounts should have won, and a combination of bad pitching and bad luck conspired against them as they dropped their third straight game and fourth in the last five games overall. Amid all of that anger though, an interesting fact becomes abundantly clear: it feels good to get this worked up about baseball again. For years now, a Cubs loss would be met by some eye-rolling and maybe an occasional hand-wringing gesture, but fans got over it. To paraphrase Heath Ledger’s Joker, it was “all part of the plan.” The Cubs needed to lose these games to give their young talent time to develop in the minor leagues, and they got some really high draft picks and made some serious trades as a result as they reshaped the entire roster from top to bottom. Now, with a group of veterans brought in and the youngsters really starting to come into the big leagues, expectations are on the rise on the north side of Chicago. Every Kris Bryant at-bat is met with breathless anticipation as fans await his first home run. Every diving stop by Starlin Castro is fawned over at length. Every Anthony Rizzo stolen base elicits reminders that he has more steals than the entire Chicago White Sox roster. These things are part of the allure of baseball, and it’s so nice to have them back. So before you get too worked up about losing a game to the St. Louis Cardinals in early May, or before you rue the fact that the Cubs could easily be 17-7 or 16-8 at this point of the season, just remember this: how much more fun is it to care about baseball than it was to ignore it and wait for Bears season to start? From one observer’s perspective, this is a heck of a lot better. The Chicago Cubs welcomed new third baseman Kris Bryant to Wrigley Field on Friday afternoon for his first big league game, and after only getting three hours of sleep as he flew in from Des Moines, the star was ready to get things underway. “Right now, it’s a little overwhelming, but I’m ready to have fun with it,” he said in a pregame media availability. Joe Maddon and the Cubs aren’t hesitating to throw the youngster to the wolves right away, as he will bat in the clean-up spot and play third base in Friday’s game against the San Diego Padres. 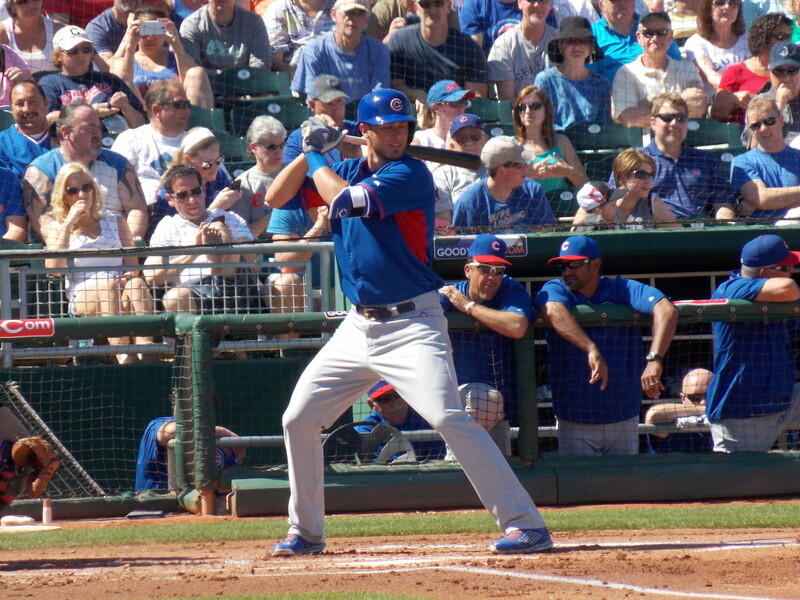 With Mike Olt and Tommy La Stella both on the disabled list, Bryant has an opportunity to grab a roster spot for the long haul over the next few weeks, but he’s focused more on the day-to-day chances that his new spot gives him. “When you start putting expectations that are way out there, you start losing sight of what’s important in this game,” he said. High expectations can be the downfall of many players, but Bryant doesn’t seem to be one of them. He has excelled at every level of professional baseball he has played at so far, and even after he was sent down following a nine-home run stint in Cactus League play, he slugged three more home runs for the Iowa Cubs before his call-up. Fans can count Maddon among the chorus of people who don’t believe that Bryant will be affected by the pressure surrounding him. As for what the plans are for Bryant after his initial time at third base, Cubs President Theo Epstein indicated that he believes the slugger will remain at the hot corner for the foreseeable future. Bryant is only 23 years old, so his career with the Cubs could end up lasting a very long time. Even with that bright future ahead of him, his debut is still a moment for celebration for him and his family, and they will be in the building at Wrigley Field on Friday.